We highly recommend this! Take a walk through New York with a Big Apple Greeter. You'll get a private, personalised guided tour through the city and hear lots of things that you won't read in the guidebooks. The BAG organisation is a group of volonteers who want to share their enormous passion for the city. We wanted to know more about the Dutch settlers in New York and had mentioned the book "The island at the center of the world" by Russel Shorto - which is a great book if you are interested in the history of America and the role of the Dutch - in our BAG request. Our greeter, Naomi, specially read that book to make sure she was well prepared. We walked for hours and saw and heard so much. Not only about way back when, but also about today's life in New York City. The couple of hours with Naomi have left some great and lasting memories. 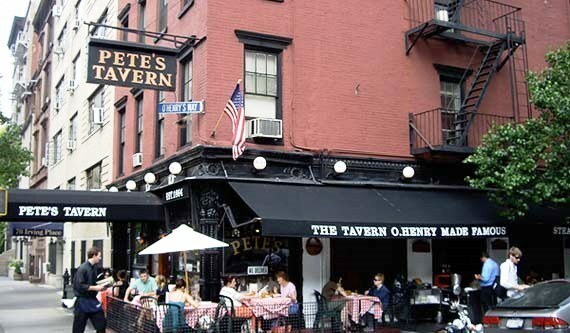 Especially the visit to "Pete's Tavern", a bar that we happened to walk by and was not opened yet.But the owner was just putting some stuff out and we greeted and when Naomi explained what we were doing he invited us in.He talked us through the history of Pete’s, and took us back to the early days, when the Tavern still was a "speakeasy". And about the tribute to his niece who had died in action (she was a police officer) during 9/11. The next day Naomi and her husband Mike invited us on a private tour through Soho, and took us to their special spots. Which was also real cool. We went to various artgalleries, bars and into a little museum that we never would have went into but was so great to have seen! So really, if you have the time, have a Big Apple Greeter show you around the area that you’d like to know more about and experience it as a true New Yorker. You can reach Big Apple Greeters by phone: +1-212-669-8159 or by e-mail. Good to know: it is free and they have a no tipping policy. But donations through the website are highly appreciated!